Look what I found in my drafts folder. Welcome back to project Morrowind. The nice visualization of where Aryon could be was very close now. I went with the stupidest approach: go through all pixels on the map, convert each one into a point in the game world and find how long it would take Aryon to get there (by using the method I mentioned previously: go through all points in the graph we know the shortest travel time to and find the one for which the total travel time (shortest time to travel to that point + time to walk from that point to the destination) is the smallest). Except I forgot this was Python and I was going to go through, for each point on the map, about 2400 possible routes through exterior points. And there were 1650x1900 = about 3 million points. Sure, I could be smart about it and use various optimisations (like coalescing exterior points that are close enough to each other and treating them as one or exploiting the triangle inequality (as mentioned in the previous post) or looking at 2x2 blocks on the map instead of each pixel or using all 4 cores of my CPU instead of one). Or I could farm it out to a C++ program. 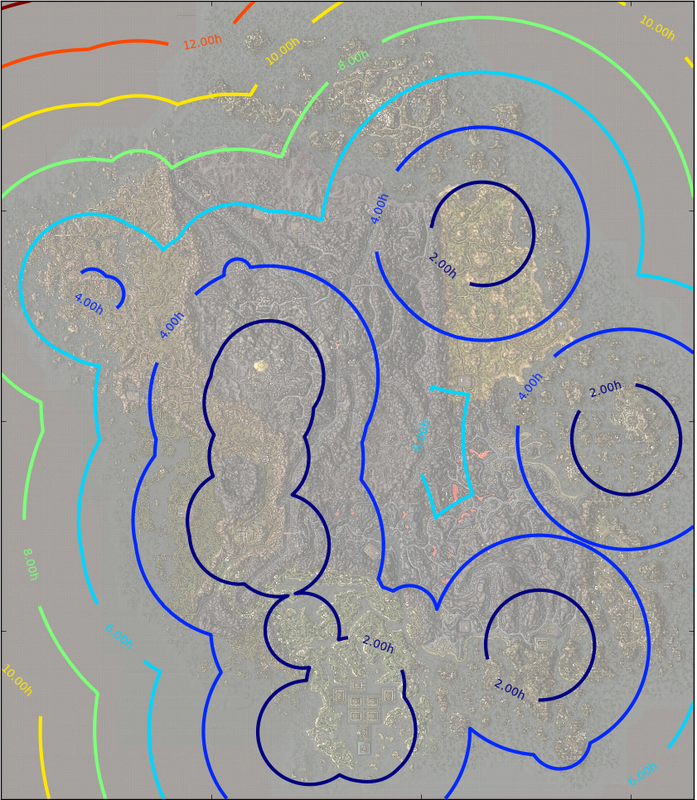 So I dumped the list of known exterior coordinates and times of the shortest routes to those to a file as well as the in-game coordinates of the 3-ish million points on the map I was interested in. The program would take those and spit out, for each sought coordinate, the shortest time it would take for Aryon to get there from his tower. In fact, it took 40 lines and ran in about 10 seconds. It's pretty amazing how fast you can be if you speak to the bare metal. I then used matplotlib's contour plot to visualize the heatmap I got. I didn't manage to get it to actually overlay on the map in the map's original resolution, but the wizards were still extremely impressed and said that I should speak to them whenever I was interested in seed funding for my startup. So this actually makes sense. There's a 2h circle around Aryon's home (northeast portion of the island) from where he could either walk or teleport to Wolverine Hall through Divine Intervention (an island east of Vvardenfell). Wolverine Hall has a Mages' Guild, so that means he could instantaneously get to four other major towns (a blob along the west edge of the island). So there are quite a few places he could get in 2 hours! After that, he would have to take the Silt Strider or a boat, which would slow him down. In 4 hours he would barely be able to reach Gnisis (northwest corner of the island) or Maar Gan (the little arc at the top of the 4h contour around the main population centres). He, of course, could walk from his original location for 4 hours but he wouldn't get very far. In 6 hours he could be anywhere on the island and in 8 he would be able to reach the northern edges of Dagon Fel, a small island north of Vvardenfell. Finally, in about 11 hours he could very possibly be having breakfast with Big Head in the most desolate corner of Morrowind. Perhaps he had some business there? The wizards said last time they ever saw Aryon was at about 2am, so he'd been gone for almost 10 hours by that point. Luckily as we were trying to figure out if he would deliberately take the most efficient route to get as far away from his tower as possible, we heard a loud noise from a nearby wardrobe and an asleep but still alive Aryon fell out of it. In the end, he loved my contour plot as well and hung it up on his wall. Some people say the tower steward still uses it to track down people who go missing in action during Aryon's wild parties. Next year on project Morrowind, we'll talk about my assignment with Vvardenfell Office for National Statistics to make sense of the island's demographics.